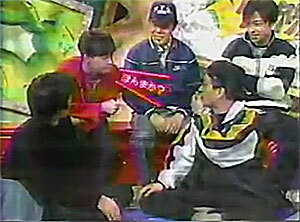 From Downtown Kazaana (かざあなダウンタウン) a show that was ran during 1995 - 1996 with Downtown as hosts. These clips focus on some of their group talks. NOTE: There may be higher quality versions of some of these talks in an hour long special I found and will be posting. But these still seem edited slightly different (in terms of text on screen and the ending), so I will leave these up here for completion.